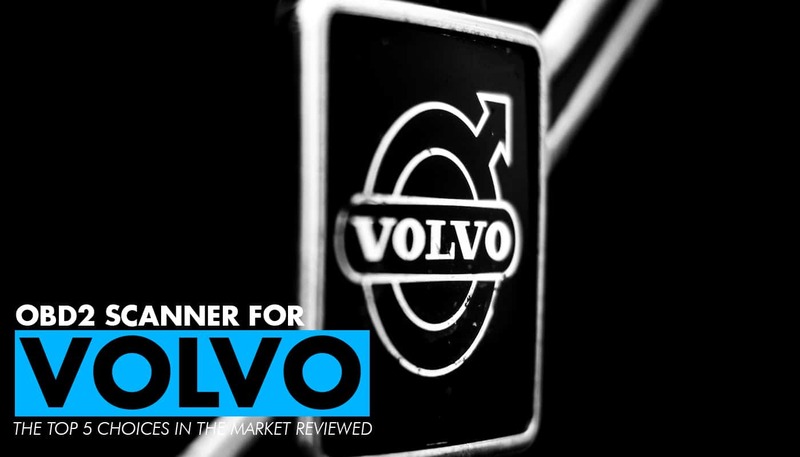 When comparing different auto brands, Volvo is one of the most well-respected. These cars are known for being some of the safest and most reliable on the market. However, although you can trust your Volvo to get you from point A to point B, you still want to make sure that you’re keeping it in excellent condition. For that, you’ll need an OBD2 scanner. Today we’re going to be looking at the best OBD2 scanners for Volvos, as well as discuss the various features that will help you get the most out of your vehicle. Let’s see what they have to offer. When picking out the best OBD2 scanners for Volvo, you can either get a generic model that comes with a variety of brands, or you can get one like the Volvo Vida Dice. This is a brand-specific scanner, meaning that you can only use it on these vehicles. If you are a Volvo owner, then you probably are sticking with the brand for a long time. Since these cars are so reliable, it makes sense that you wouldn’t switch to another automaker. Thus, having something explicitly built for Volvos can help ensure that you’ll always find the right codes. It’s also more efficient than having to cycle through various makes and models that don’t apply to your vehicle. When OBD2 first came out, it was designed to monitor your car’s emissions, as well as tell you what the check engine light meant. Fortunately, modern scanners have more capabilities, like this one, which can connect to your Volvo’s onboard computer. With this device, you can scan other systems like battery, brakes, and airbags. Diagnostics is much easier when you have access to everything going on under the hood. Overall, we appreciate that this is a Volvo-specific scanner. Also, it’s much easier to set up and use than other models out there, so you shouldn’t have any problems with it. If you have a Volvo truck, you won’t be able to use this device. Also, it doesn’t come with a comprehensive list of codes, so there’s a chance you’ll have to use another scanner. Next, we have another scanner that’s built for Volvo vehicles. However, this one is a little more user-friendly because you don’t have to connect it to a computer to see what’s going on. That being said, this is an excellent model for both casual owners and enthusiasts. For the most part, OBD2 scanners are handheld devices with their own software and screen. While this one is smaller than average, it’s still easy to read and comes with an intuitive menu interface. The benefit of having something like this is that you can keep it in your car and check on it whenever you like. Since you don’t have to bring a computer, it’s much easier to manage. As with most modern OBD2 scanners, you can check on everything connected to your onboard computer. Brakes, airbags, batteries, fuel, and all of your check engine lights are included with this system. Best of all, you can get free updates online if you’re missing anything. While the Volvo Vida is a bit more powerful, this is a handy tool for anyone who owns a Volvo. Because it’s brand-specific, it works faster and more efficiently than generic scanners, and you can always get new codes online. The screen may be a little small for some users. Also, the software can be glitchy at times, forcing you to reset the device. Although having a scanner made for Volvo can make things easier, they usually don’t have as many features as you might need. Instead, you may prefer to get a professional-grade scanner like this one from Autel. The Maxisys Elite is designed for mechanics, so it’s perfect for anyone who wants to take care of their Volvo in the comfort of their garage. One reason we like this scanner is that it comes with a proprietary tablet. Not only does it make it easier to read all dtc codes and navigate through the menu screens, but it’s built to handle rough environments, so you know that it will last. Because this is the Elite model, you get access to a lot of data you wouldn’t with other scanners. You can find repair manuals, check your vehicle’s performance in real-time, and monitor all of your Volvo’s internal systems. There are far more features than we can list here, and all of them are professional-grade. Overall, this is one of the best OBD2 scanners you can find anywhere. We like that it comes with a complete list of codes and that you can update it online for two years. Also, having repair manuals and live scanning makes it a much more versatile tool than most other devices you can find. If you’re not serious about taking care of your Volvo, then the price tag will likely turn you off. Also, the software can be a bit sluggish at times, so keep that in mind. Next, we have another Volvo-specific scanner. However, what sets this one apart from the others is that it can also work with other OBD2 vehicles, providing generic check engine codes if necessary. One of the best features of this model is that anyone can use it. The menu is intuitive, and the large screen is easy to read. Since it’s made for Volvos, finding the right code takes less time, meaning that you don’t have to search through endless makes and models. Overall, we highly recommend this unit to casual Volvo owners who want to be able to diagnose issues and reset their dash lights. It doesn’t come with as many powerful features, but it’s reliable. Although this is a relatively simple device, you can still monitor your car’s performance in real-time. Better yet, you can freeze frame the data to provide a snapshot into what’s happening under the hood. This is the perfect OBD2 scanner for most Volvo owners. It’s small enough to fit into the glove compartment and simple enough that anyone can master it. Live data streaming is just for the engine, not other internal systems. Also, it doesn’t have a complete list of codes, so you may have to supplement with another scanner if you want to check additional systems in your car. Our final model is another handheld scanner, meaning that it’s both simple to use and convenient to keep in your car. Innova is one of the better brands out there, so you can buy this device with confidence. As we’ve mentioned, modern OBD2 scanners can do more than just check emissions and the engine. In this case, you can monitor all systems connected to your onboard computer. Oil levels, fuel efficiency, tire pressure, airbags, brakes - it’s all available. No matter what issues your car is having, you can diagnose them with this scanner. One of the other benefits of going with Innova is that you can find repair manuals online. This way, you don’t have to take your vehicle to the shop just to get a simple fix. Instead, look up the problem on the device, find a manual, and repair it yourself. This is one of the best handheld models out there. While you do have to cycle through 80+ different brands, it offers more diagnostic solutions than most other “generic” devices. Since it’s not made specifically for Volvo, you might not have all of the codes you need. Also, the software can be glitchy on rare occasions, although it doesn’t happen as often as with other devices. If you’re trying to keep your Volvo in tip-top shape, then the Volvo Vida Dice is going to be your best bet. Since this scanner is specific to this brand, you’re sure to find everything you need. We also like that it connects to your computer so that you can read the data easier and find updates at the same time. If you prefer a professional-grade scanner that works for a variety of makes and models, then the Autel Maxisys Elite is the best of the best. Yes, it’s expensive, but it provides so many features and benefits that you can almost open your own mechanic shop with it.